June 28, 2012 - FedEx Express has agreed to purchase 19 additional B767-300 aircraft from The Boeing Company to continue to improve the efficiency and technology of te FedEx air fleet. As part of the agreement, Boeing has agreed to convert four Boeing 777s two in fiscal 2016 and two in fiscal 2017 to 767 equivalent purchase value. 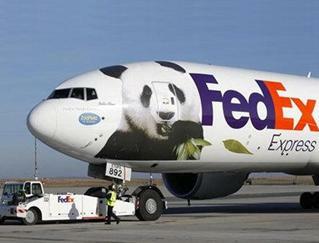 FedEx Express currently operates 19 long-range 777 freighters and now is committed to purchase an additional 24 777s. The 19 767s will be delivered from fiscal 2015 to 2019 and replace current MD-10 and A310-200 aircraft. The impact to capital spending in fiscal 2013 and fiscal 2014 is immaterial, and estimated fiscal 2013 capital spending remains at $3.9 billion. The 767s are substantially more fuel efficient and reliable than the aircraft they will replace. The 767s will provide similar capacity as the MD10s, with an approximate 30 percent increase in fuel efficiency and a reduction in unit operating costs of more than 20 percent. They also increase efficiency by sharing spare parts, tooling and flight simulators with the Boeing 757s which are part of the FedEx air fleet. “FedEx Express is positioning itself for more profitable growth by modernizing its aircraft fleet and better aligning its U.S. domestic air network to match current and anticipated shipment volumes,” said David J. Bronczek, president and chief executive officer of FedEx Express. This action is in addition to a FedEx Express agreement with Boeing announced in December 2011 to purchase 27 new 767s for delivery between fiscal 2014 and 2018 and delay delivery of a number of 777s. In June, FedEx announced the permanent retirement from service of 18 A310 aircraft and 26 related engines, as well as six MD10 aircraft and 17 related engines, bringing the total to 50 aircraft to be retired by the end of fiscal 2013.